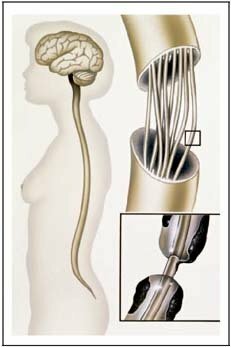 Multiple sclerosis is a demyelinating disease. But what exactly is that? 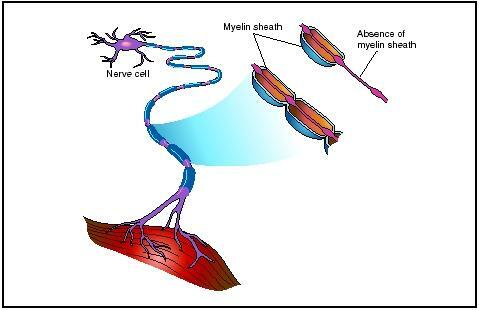 Basically, it's any disease of the nervous system where the myelin sheath of a neuron or nerve cell is damaged. MS is one disease that falls into this category. Believe it or not, there are many more diseases that can cause demyelination. Also, the nervous system has two parts – the central nervous system or CNS and the peripheral nervous system or PNS. Both of these can be effected by demyelination. The CNS consists of the brain and spinal cord. The PNS connects the central nervous system to the limbs and organs of your body. It consists of all the nerves that extend out from the spinal cord. This is how the signals from the brain travel to every part of your body telling your hand to grip or your leg to walk for example. Multiple sclerosis effects the nerves of the CNS not the PNS. There are also diseases that only effect the PNS. Demyelination is the effect of the above diseases. The causes of the different diseases can be many different things. As far as MS is concerned, most believe it is an autoimmune reaction to something like a virus. This causes the immune system to attack itself. Nerve cells are attacked by white blood cells which, unfortunately causes damage in the form of scars along the myelin sheath. The scars result in all sorts of symptoms depending on which nerves are damaged and in which particular area along the nerve cell the scars are located. When the nerves in the CNS are damaged, you will develop something like MS or Devic's disease. It takes a neurologist performing a thorough neurological exam to determine the exact cause of your problems. This exam will most likely consist of several kinds of tests to track down the exact cause of your symptoms. Even then, it still may be difficult to determine which demyelinating disease you have because many of them are closely related. We have heard of people being misdiagnosed for having MS, however, for the most part, the many different tests, as well as the history of the person being examined, make the diagnoses pretty accurate. If you have any questions or don't feel comfortable with your doctor's findings, get a second opinion. That is well within your rights. Go from Demyelinating Disease back to What is MS?